The Living End just dropped the flippin’ motherload. It’s been 5 years since we last heard from the Aussie veterans now they’re returning to reclaim their crown as the kings of rock n’ roll with a brand new album, a new single and a handful of national headlining tour dates. The trio’s seventh studio LP, dubbed Shift, is due out on May 13th and comes packing the previously-unveiled teaser track Monkey, as well as flagship single Keep On Running. Unlike our first lick of the band’s new record, their latest single is – shall we say – not quite what you’d expect. Instead of the angry, defiant Living End we’re used to, here the band are raw, emotional and reflective. They’ve described Keep On Running as one of the most powerful songs as their entire career. Full of swelling strings and acoustic strums, the uplifting ballad shows a rare glimpse into frontman Chris Cheney’s psyche, featuring lyrics he penned during an emotionally turbulent period of his life. “We all have moments where life is getting the better of us, but that’s when you draw strength and come out the other side stronger,” the frontman says. And the band will be taking their stronger selves – and their new record – on tour across the country, with five huge headlining dates booked in for Brisbane, Sydney, Perth, Melbourne and Adelaide this June. And their support acts are also kind of a big deal. Warming up the stage at all of the trio’s shows will be Bad//Dreems and 131s. Tickets go on sale from Thursday, 24th March. 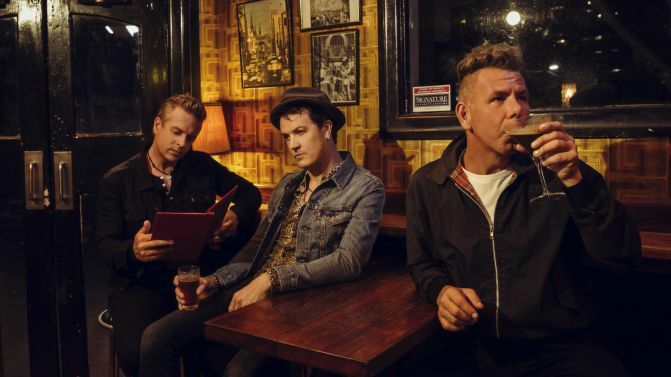 Check out all of The Living End’s headlining tour dates, alongside their new single Keep On Running, below. UPDATE 24/03/2016: The Living End have sold out their Melbourne show and added another. Check out the new date below. Tickets on sale from Thursday, 24th March.